Is Shakespeare’s The Taming of the Shrew inherently misogynistic? Particularly with its treatment of spirited Kate, the Shrew of the title, who is starved and mentally tormented (gaslighting long before Patrick Hamilton, Ingrid Bergman or Donald Trump: “I say it is the moon [not the sun] that shines so bright”) into the role of an apparently submissive wife, is there any way around that charge? How do modern feminists feel watching the play today? After lively panel debates following The Caucasian Chalk Circle (twice), ‘Tis Pity She’s a Whore, The Beggars’ Opera and Tamburlaine, I was delighted to chair the latest in a series of post-show panel debates for pioneering Lazarus Theatre company, which specialises in reimagining classics from the canon for modern audiences. This new production of The Taming of the Shrew, is adapted and directed by Lazarus associate director and dramaturg Sara Reimers, marking her full production directorial debut. In addition to chopping the text down to a swift 90-minute running time, including the play-within-a-play prologue, setting Shrew at an open-air music festival and inserting a gender roles disco, Sara has regendered the role of Baptista and cast two other traditionally male roles as women to achieve a 50/50 male/female ratio in the company. For last night’s post-show talk at Brockley Jack Theatre, I was joined by Sara and special guests: Elizabeth Schafer, Professor of Drama and Theatre Studies at Royal Holloway University, whose academic texts include a full performance history of The Taming of the Shrew (her position prior to this Lazarus viewing: it should never be staged again! ); Kemi-bo, an actor who featured in Lazarus’ all-female Henry V and founder of all-female creative initiative The Darlings Club; and Rebecca Manson Jones, theatre maker and Women’s Equality Party candidate. 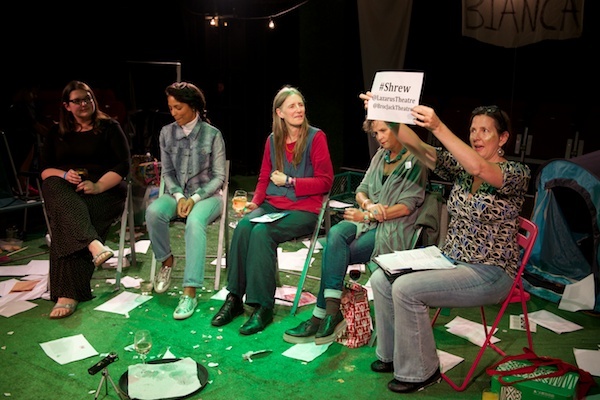 To the best of my memory, in my 15+ years of chairing hundreds of post-show talks, this was the first one I’ve chair with an all-female panel – which provided a rather fitting opening to a fascinating discussion of women’s roles in the play, theatre, society – and, crucially for our political times, in the resistance. Have a listen to the unedited podcast – warning: I end on an angry note! – plus Q&A photos care of Peter Jones, production photos and live-tweeting from @LazarusTheatre care of artistic director Ricky Dukes. The Taming of the Shrew continues at London’s Brockley Jack Theatre until 5 August 2017.